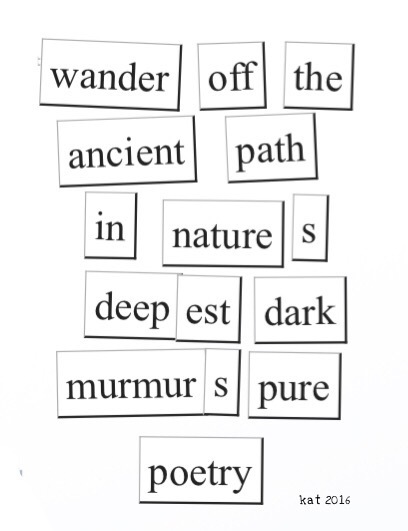 This entry was posted on Saturday, July 30th, 2016 at 11:30 pm	and tagged with elusive Trope's Magnetic poetry challenge, path, true poetry and posted in Challenges and Writing Prompts, Magnetic Poetry, Poetry. You can follow any responses to this entry through the RSS 2.0 feed. That is really good! N.
Thank you so much! K.
Stunning! amazing what this magnetic poetry can offer up and how creative the combinations! This kind of your poetry is becoming my fave! It’s a lot of fun to write too! Like putting a puzzle together! a kind of implied “O’ Vagabond” in the splendid words-of-wisdom.